The topic of assessment in education is complicated. We think assessments have gotten a bad rap over the years—perhaps for good reason, perhaps not. In this article, we explore different ways that assessments can play a crucial and positive role in supporting successful learning. By approaching the topic of assessment more broadly, school and district leaders can help students and their parents to understand better the benefits of assessment. A 2013 research review concluded that practice testing and distributed practice, or practicing over longer periods of time, were two of the most effective strategies to improve long-term recall ([i]). Practice testing is a form of retrieval practice—the act of calling information to mind. The Learning Scientists, Megan Smith and Yana Weinstein, explain that “…if you practice retrieval you’re more likely to remember the information later, and also more likely to be able to use and apply the information in new situations” ([ii]). Formative assessment, or assessment for learning, is what teachers do in their classrooms to gather information about how students are learning. It can be formal, like a quiz, or informal such as a verbal question and answer session with students. Teachers can incorporate formative assessments such as these into both traditional and project-based learning classrooms across all content areas. Teachers must understand what students know, what they can do, and what they still need to learn. Everyday formative classroom assessments can provide that information. Researcher Thomas R. Guskey finds that the “best classroom assessments also serve as meaningful sources of information for teachers, helping them identify what they taught well and what they need to work on” ([iii]). All stakeholders—educators, parents, students, and administrators—need evidence that students are actually learning. A balanced system that includes formative and summative assessments provides the best evidence for what students are learning ([iv]). Many formats of assessment questions, from multiple-choice to constructed-response to performance-based, may be used. A system of well-constructed formative and summative assessments allows students to demonstrate their abilities and knowledge and then reflects how close they are to meeting educational goals and standards. Evidence from assessments can be directly beneficial to students. 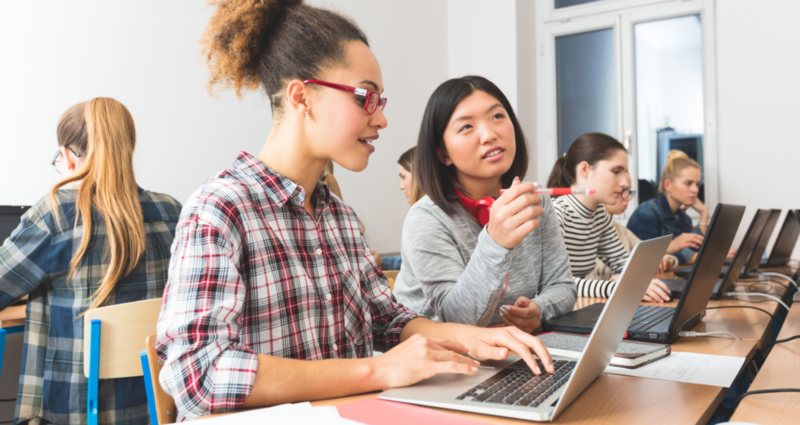 When assessment activities are aligned with instructional activities and content standards, teachers can provide students with information about which concepts and skills they need to learn. Then teachers can use assessment results to help students understand what they already know and what they still need to work on ([v]). Reduced test anxiety is one of the potential benefits of practice testing. High-stakes statewide assessments can make students nervous. However, preparing students using low-stakes assessments with similar formats and questions can be instrumental in making them feel more comfortable when they are in formal assessment settings. Furthermore, practice testing does more than teach test-taking skills and calm nerves. Frequent in-class practice can help students understand their mastery of the content, which, in turn, can help reduce test anxiety. As students prepare, they will become more comfortable answering different types of questions and, therefore, develop proficiency with learning goals ([vi]). As one expert argues, “This isn’t just a matter of teaching students to be better test takers…effortful, varied practice builds mastery” ([vii]). [i] Bradley Busch, “What every teacher should know about … memory,” The Guardian, October 6, 2016, https://www.theguardian.com/teacher-network/2017/oct/06/what-every-teacher-should-know-about-memory. [ii] Megan Smith & Yana Weinstein, “Learn how to Study Using… Retrieval Practice,” (blog), The Learning Scientists, June 23, 2017, http://www.learningscientists.org/blog/2016/6/23-1. [iii] Thomas R. Guskey, “How Classroom Assessments Improve Learning,” Educational Leadership, February 2003 issue, http://www.ascd.org/publications/educational-leadership/feb03/vol60/num05/How-Classroom-Assessments-Improve-Learning.aspx. [iv] Stephen Chappuis, Jan Chappuis and Rick Stiggins, “The Quest for Quality,” Educational Leadership, November 2009 issue, http://www.ascd.org/publications/educational-leadership/nov09/vol67/num03/The-Quest-for-Quality.aspx. [v] Thomas R. Guskey, “How Classroom Assessments Improve Learning,” Educational Leadership, February 2003 issue, http://www.ascd.org/publications/educational-leadership/feb03/vol60/num05/How-Classroom-Assessments-Improve-Learning.aspx.